As a transportation company, sometimes you may have corporate clients who require invoices. Book Rides Online has a great Invoicing feature that allows you to send an invoice or multiple invoices together. This can be very helpful to use for corporate clients. For example, if you drive an employee for a business often and they prefer to have you email/mail invoices to them and then send you payment via check, this can be easily accomplished with our Invoicing Feature. The first step starts in your reservations. For each reservation that needs to be invoiced, you’ll need to change the payment type to “invoice”. From within a reservation, you can find the payment section at the bottom of the page. Choose “Invoice” in the drop down menu for payment type. Then you can choose to enter a due date if you’d like. You can send the invoice email from here or choose to do it later if you’d like to send multiple invoices together. A red ‘x’ will show if an invoice email has not been sent and a green check will show if it has been sent. In addition, you’ll see a bar showing invoiced date, invoiced by and emailed to. These will update after an invoice has been sent. We have created two other places to view all of your invoicing. If you need to view all invoices for a specific client, they can be viewed from within their client profile. To reach this, first go to the “Clients” page. Locate the client you are looking for and click the red edit wheel located to the left of their name. Choose the “Invoicing History” tab. By default, all unpaid invoices will show. If you would like to see all paid and unpaid invoices sent, check the box located in the upper right corner. The data will show who sent an invoice, the date the invoice was sent, how it was sent, if there was a due date, the total amount due and the reservation number(s) that were included on that invoice. You can also mark the invoices paid by clicking the button located to the right of each invoice labeled “Mark Runs as Paid”. Please note: This data only shows invoices that have been sent to a client already. The best place to do all of your invoicing is from the main invoicing page. From here, we have made is extremely easy to view all of your invoices past, present and pending and send multiple invoices together as one document.To reach the main invoicing page, go to the “Invoicing” page. You can find it listed on the far left of your screen near the bottom. Located at the top of the page are date fields allowing you to widen or narrow your search. There is also a search bar located in the top right corner that allows you to search through the invoices by any field that is shown. 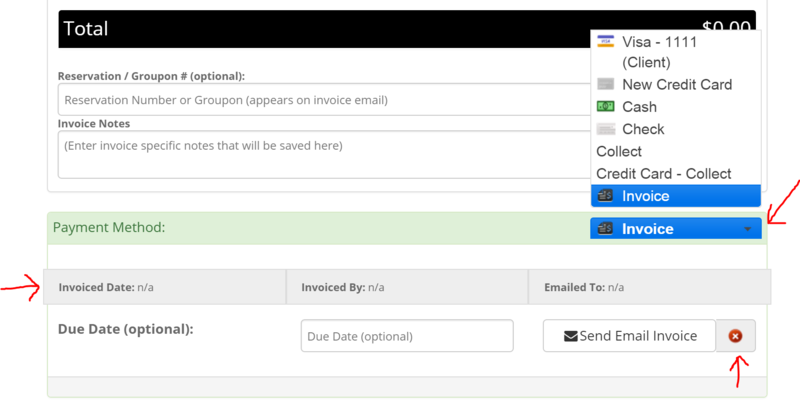 Invoices are grouped by client. Each reservation that has been marked “invoice” in the payment section will appear here. 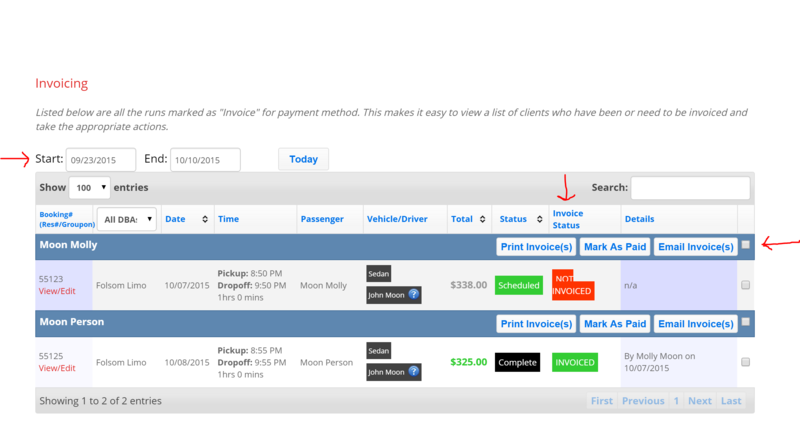 You can see in the “invoice status” column that it shows whether or not the invoice has been sent to the client yet. The next column over shows who sent the invoice and when they sent it. By checking the boxes to the right of each reservation, you can use the three buttons listed by each client’s name and choose to either print the invoice(s), mark the invoice(s) paid or email the invoice(s) to the client. If you choose to either print or email the invoices from here and choose multiple reservations, it will put them together on one document (it will still break them down separately but then show a total due amount at the bottom). When a reservation has been marked paid, the total amount due will show up green. When the amount shown is grey, this indicates that the reservation has not been marked paid yet. Please note: The invoicing page does not show ALL reservations for a client. Only reservations that have been marked with a payment type of “invoice” will be shown on this page.